Libya’s fate might come to a turning point this year and ironically the emergence of a possible future leader in a Gaddafi-like general might be the only chance to bring about change in the North African country. Seven years ago, Libya, as most countries in the Middle East, was struck by the hopes of positive change brought about by the Arab Spring. While dictatorial regimes in neighboring Tunisia and Egypt fell quickly, Libya’s Muammar Gaddafi resisted. Fearing a loss of momentum for the revolution, Western allies decided to intervene and establish a no-fly zone above the country. The NATO intervention eventually overstepped its mission and helped rebel forces destroy the Libyan military air defences, resulting in the ousting of the Gaddafi regime. Rebels ultimately killed the former dictator and what started as a hopeful revolution ended with a country engulfed by chaos, on the brink of becoming a failed state. In the past seven years, Libya has faced increasing instability, the emergence and rapid spread of terrorism, economic decay, emigration topped with human trafficking, and most importantly, entered a political deadlock. Despite an international attempt at establishing an interim coalition government in 2015 (the United Nations-backed Government of National Accord (GNA) based in Tripoli), power remains in the hands of the elected House of Representatives (HoR) based in Tobruk and the General National Congress (GNC), based in Tripoli. Both were established after the failed military coup of 2014, but did little to improve the situation, and instead, further divided the country. 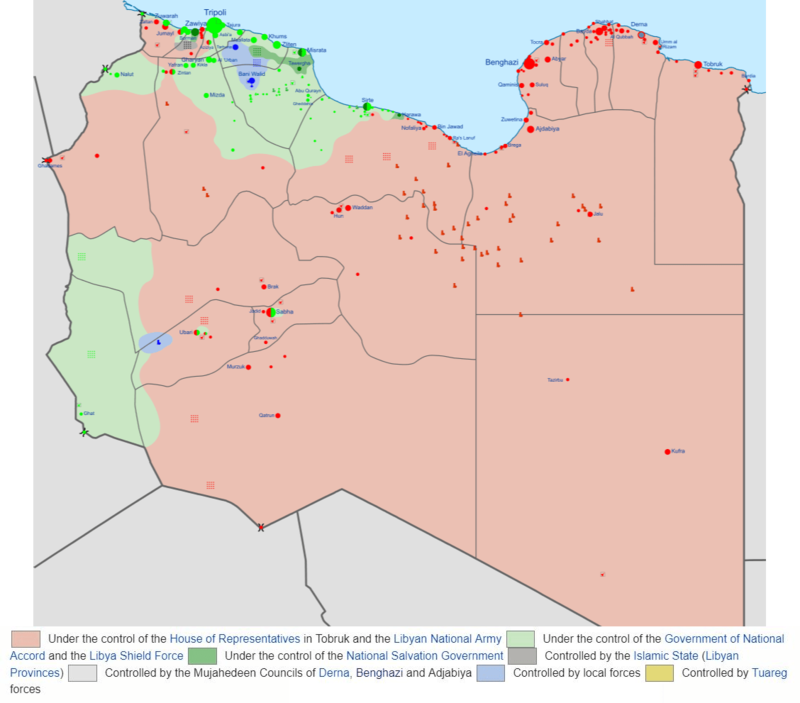 Libya thus remains fragmented, and apart from one failed attempt at democratic consolidation in 2014, efforts have been focused on fighting the surge of terrorism (both the Islamic State and Al-Qaeda maintain a strong presence in Libya), rather than on unifying the country. Additionally, the tribal structure of the Libyan society also make it harder to find compromise among the warring parties. Ironically, despite the attempt of the revolutions of the Arab Spring to bring democracy to the region, what could re-establish stability in Libya is what ignited the upheaval in the first place. Today, it seems like the person who is most likely to unify the war-torn country is General Khalifa Haftar, a ruthless military strongman often dubbed as the new Gaddafi. Haftar, the commander of the Libyan National Army (LNA) in the east of the country, is backed by the HoR, as well as local tribes in both Eastern and Western Libya. His ability to bring cohesion to a country in desperate need of it is supported by the fact that the LNA, under his command, has been successfully united from a melting pot of disparate groups, including regular troops, armed tribal groups and Salafists. Haftar rose to fame both within and outside Libya after launching his anti-terrorist campaign, Operation Dignity, aimed at Islamist militants in Benghazi, in 2014, granting him the support of Egypt, Saudi Arabia, the United Arab Emirates, France and, to some extent, Russia. Despite critical voices regarding his true intentions, it is commonly accepted that this partial and periodical unity in Libya brought about by Haftar provides a good opportunity for establishing long-term conciliation between parties and laying the grounds for democratic elections. Indeed, taking advantage of the momentary truce in the country, France proposed holding parliamentary and presidential elections by the end of 2018. The heads of the GNA, the HoR, the High Council of State (an advisory body also formed in 2015) as well as General Haftar, have been invited to sign the initiative drafted by the French Foreign Ministry. The French proposal also includes a referendum on a new constitution, the unification the Libyan central bank and outlines possible sanctions if the electoral process is disrupted. Nothing shows the fragility of the political situation in Libya more, than the rumors about Haftar’s illness and the end of his political career. In April, the 75-year old General flew to Jordan for medical care and then supposedly spent weeks in a military hospital in Paris due to a stroke that many thought has had an incapacitating affect on him. He recovered and returned to Libya at the end of the month, refuting claims about his inability to lead the LNA and potentially the country as a whole, but his absence caused disruptions not only within the Army, but also among the country’s political elites. Despite his current domestic and international backing, Haftar was and still remains a controversial figure. Back in 2015, he refused to recognise the internationally-brokered Libyan Political Agreement (LPA) that established the UN-backed governmental structure and urged the HoR not to ratify the agreement or agree to any of its amendments. Even last year, in a televised speech, he called the UN-mandate void and denounced its lack of legitimacy. The first official mediation meeting took place on 29 May in Paris, where, apart from Libya’s political elite, representatives from as many as twenty countries were present. The international attendance highlights the need for a regional and international solution to Libya’s situation as its current fragile state and involvement in terrorism brings instability to its North African neighbors, the wider Middle East, as well as Europe. It also underlines the diverging interests in the country, not just between domestic actors, but also among European powers, such as Italy and France). However, it is commonly understood that France’s swift swing into action is aimed at reinforcing Haftar’s current position, who, despite his past stance, might use the opportunity to take advantage of the international push for settlement in the country, or to seize power. The original aspirations of the Arab Spring failed in most countries of the Middle East, therefore it is too early to wish for a democratic Libya. The priorities of the Libyan elite and the international community should be to stabilize the country and drive out terrorism. If a general is the only one who can bring security and unity to a country on the brink of collapsing, the opportunity should probably be seized to avoid Libya becoming a failed state.